Description: Free, public domain image: Sailors Aboard a Special Warfare Combatant Craft . STENNIS SPACE CENTER, Miss. 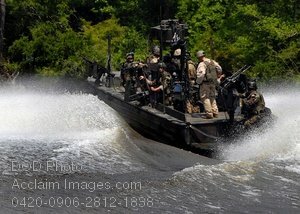 (June 17, 2008) Special warfare combatant-craft (SWCC) crewmen assigned to Special Boat Team 22 traverse the waterways of the Stennis Space Center as they utilize the brand new riverine live fire training range. U.S. Navy photo by Mass Communication Specialist 1st Class Chad Runge.